Well, it has been an eventful few days...weather has been both wild and generous and we have pushed on and on... Today after seven days on the road, we are taking a much needed day off. It was pretty rainy most of the morning....so we hunkered down in our tent, now we are in town doing laundry and Glenn is off in search of a replacement spoke. After a cup of coffee with Tom and Val we headed out....not quite into the wind...but close. We were headed in a straight line west from Strathroy to Sarnia, there was a strong wind coming for the north which slowed us in the morning...but we were used to it by that point. 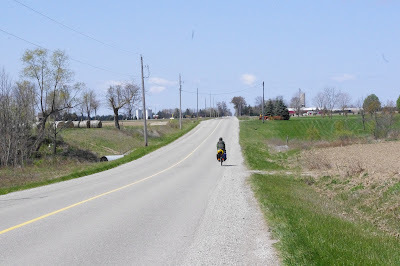 After we stopped for lunch the wind eased off a bit, and there seemed to be a slight decline all the way to Sarnia...for the first time of the trip we travelled at a near normal speed....it was lovely! Once in Sarnia we headed south for about 30 km to just south of we would take a ferry to the US. We found a campground along the way, which was closed, so we asked at the sports centre if we might be able to stay at the campground. They said that they weren't sure, but I (ali) pressed a bit, and eventually they called someone to ask....we were told that we could camp there, but there were no facilities (we would have to use the bathrooms at the sports centre 1 km) away, and it would cost $38.00.... Well, that's what you get for asking. We decided it was a bad deal, instead we spent a bit more and stayed at motel near to the ferry in Sombra.... So good to sleep in a bed!!! We made it into the USA! Hooray! Also we had a tailwind....aww. All this made us not care that it was super cold and we had to camp in the woods because the park that we going to stay at didn't have any camping.... Who cares, we were fast biking in the USA! We took a straight road once we crossed the border and met many friendly people....quite a stark contrast from Canada, oddly. We got to Stoney Creek, the park we were going to stay at, around 4:00... And discovered that they don't have camping there. The folks there were extremely helpful calling around to find out where would be open....but it turned out that the closest place was about 45 miles away....through the town of Pontaic, which they suggested not biking through at night if we wanted to finish the trip alive....good advice, I guess? One of the workers, Don, even offered to give us a ride to the state park and gave us his number in case we got into any trouble... we thought it was a little early in the trip to be accepting rides, but thanked him kindly. We decided not to risk it, and hopped on a rail trail in the general direction we wanted to go to look for some woods. We ended up finds an isolated clearing in the woods near the town of Rochester....a perfect stealth camping location! No grumpy rangers came by, and we had a great sleep ! It started raining in the night and continued into the morning... we had planned to take the day off, so took our time getting out of the tent and into the rain...and under our not so functional tarp (which we really need to replace, but are only reminded of this every time it rains...). It rained on and off... and we needed to do laundry and get Glenn's spoke fixed... so we pedalled about 8 km into town .... Right now we are waiting for the wheel fixing. Initially they had said that it would take a couple of days, but when Glenn explained that we were travelling they said that they would have it done by eight...so we're hanging out it one of our favorite locations.... the public library !